Standardizing Work for Shut-Downs | Grunau Company, Inc. When employees are thinking of a better way to do something, developing written instructions, or standardizing work processes, they are contributing to our Lean culture. Lean is not “something extra” to do but rather an integral part of our everyday work at Grunau. These Lean Construction principles and were encompassed in simple but effective documents for one of our customers. 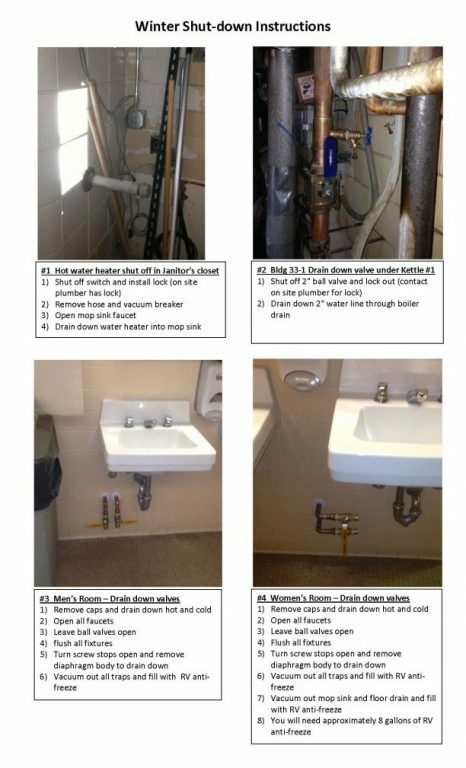 A Grunau plumber in our Service department worked with 2 office personnel to develop a set of “Winter Shut-down Instructions” for several of the mechanical systems that are not used during the winter months at MillerCoors. Having instructions written down helps error-proof the processes. The instructions also allows nothing to be missed when it is time to shut down systems for the season. These standardized work instructions include photos since visuals always help illustrate what words mean. Visuals can also be a quicker point of reference rather than reading text. We encourage our employees to always be thinking about better ways to accomplish what we do. In this way, our employees directly contribute to Grunau’s Lean culture.